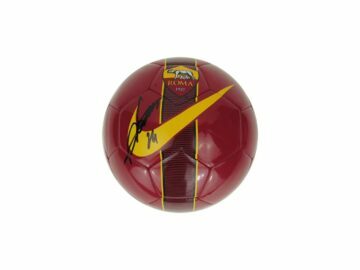 Shop for AS Roma FC signed shirts, balls, football boots and player autographed photos. All of these items come with a certificate of authenticity, free UK delivery and fast worldwide shipping. 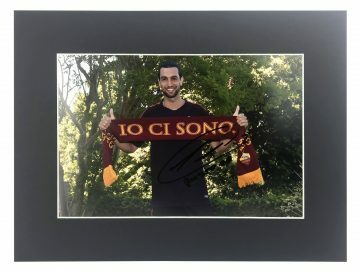 Many also come with a photo of the player actually signing the item! Rome is famous for many things – its magnificent architecture, the Vatican City, Trevi Fountain. 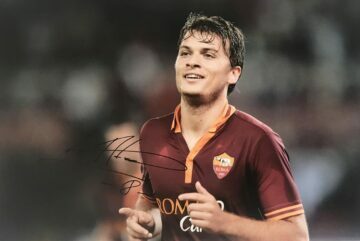 In the footballing world though Rome is synonymous with its native club AS Roma, based in the heart of the city at the Stadio Olympico. AS Roma was founded in 1927 after the merger of Rome’s three existing clubs. The main aim was to create one stronger, more successful side to rival other football clubs – a club fit for the capital city of Italy. The club suffered mixed fortunes for three decades until the early 2000s, when they returned to form in spectacular style by securing their first Serie A title. They went on to win the Scudetto. 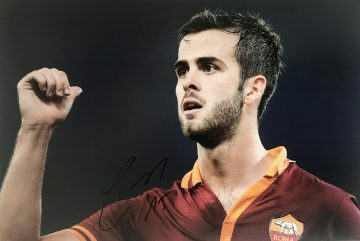 Various victories ensued, with Roma finishing with several wins and as respectable runners-up to European heavyweights including Juventus and AC Milan. It is the fifth most supported club in Italy and a great source of pride for the city. 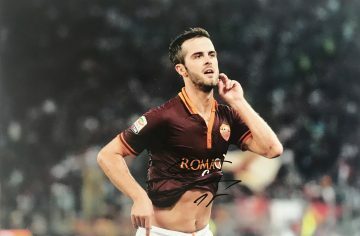 In recent years Roma FC has attracted some of Italy’s most high profile players including Gabriel Batitusta, Daniele De Rossi and Simone Perotti. At least three went on to help Italy’s national team to win the FIFA World Cup against France in 2006. In total, they have won Italy’s top league Serie A four times, in addition to nine Coppa Italia and two Supercoppa Italia titles. They also have a European Cup and UEFA Cup to their name. Roma’s crest will be instantly recognisable to most – depicting the famous female wolf with her infant sons Romulus and Remus from the myth of the founding of Rome. This is where Roma’s popular nickname ‘the wolves’ originated. Here at Firma Stella you’ll find a superb selection of signed AS Roma shirts, balls, boots & photos. 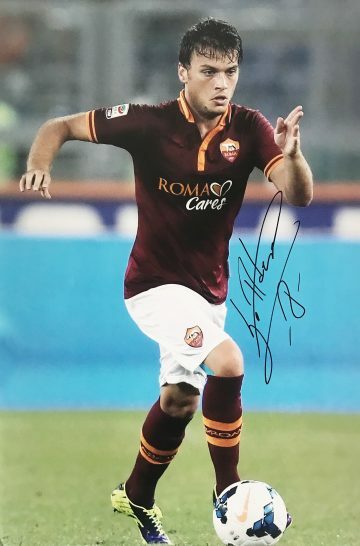 We have sourced a variety of specialist items autographed by key AS Roma FC players. 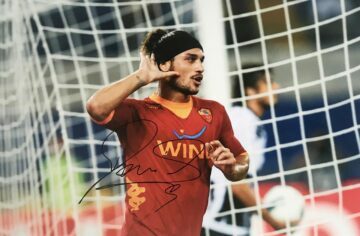 The collection spans the decades – a celebration of Roma’s triumphs and successes over the years.